Knopf Doubleday Publishing Group, 2004. Hardcover. Good. Disclaimer:A copy that has been read, but remains in clean condition. All pages are intact, and the cover is intact. The spine may show signs of wear. Pages can include limited notes and highlighting, and the copy can include previous owner inscriptions. At ThriftBooks, our motto is: Read More, Spend Less.Dust jacket quality is not guaranteed. 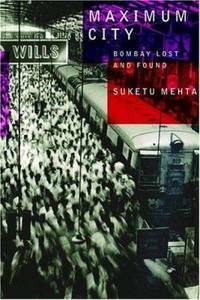 A native of Bombay, Suketu Mehta gives us an insider's view of this stunning metropolis. He approaches the city from unexpected angles, taking us into the criminal underworld of rival Muslim and Hindu gangs; following the life of a bar dancer raised amid poverty and abuse; opening the door into the inner sanctums of Bollywood; and delving into the stories of the countless villagers who come in search of a better life and end up living on the sidewalks.From the Trade Paperback edition.